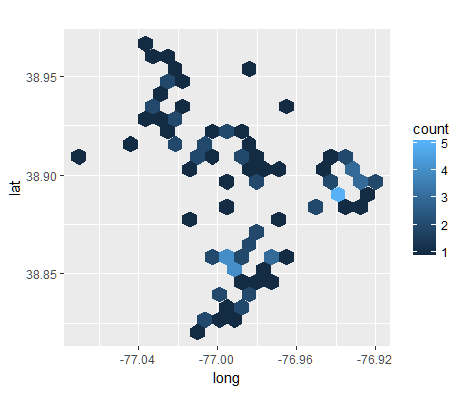 I've generated a number of plots using the geom_hex and stat_summary_hex functions in ggplot2, and I've adjusted the number of bins until the plot "looked right." That said, I'd like to know the area each bin represents to help interpret the plot. Is there a function or method to measure the area (in square miles or kilometers) of an individual hexagon when the x and y axes are latitude and longitude? Not tried it myself but the GeoSphere package includes a function for calculating area given a polygon defined as lon, lat pairs. Also got lots of other geodetic and spherical geometry formulae (great circles, vincenty, haversine etc).